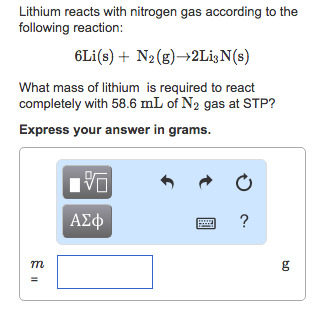 Solution: Lithium reacts with nitrogen gas according to the following reaction: 6Li(s)+ N2 (g) → 2Li3N(s) What mass of lithium is required to react completely with 58.6 mL of N2 gas at STP?Express your answer in grams. What mass of lithium is required to react completely with 58.6 mL of N2 gas at STP? Express your answer in grams.